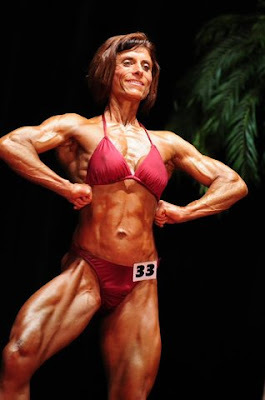 I had the pleasure of seeing Amanda McDonald compete in the 2009 NPC Natural Michigan (drug-tested) bodybuilding contest, and was very impressed with her physique and conditioning. She agreed to be interviewed for this blog. Hot Rod Anglican: Hi Amanda. I saw you compete at the NPC Natural Michigan bodybuilding contest back in July. I thought you looked great! What year did you enter your first contest, and how many bodybuilding contests have you entered in all? Amanda McDonald: I usually try to do 3 shows a year and I’ve been doing bodybuilding for 4 years. My first competition was in Grand Rapids as a Figure competitor. I came in last place - they told me I was too muscular. So, I switched to bodybuilding, did a show that following April in Kalamazoo and took 1st place. HRA: What made you want to get onto a competitive bodybuilding stage? Also, what is your favorite aspect of bodybuilding? Do you like the training, or getting up on stage, or some other aspect? AM: My husband passed away when our son was just 1 year old. After a few months of re-adjustment I needed to do something for myself. So, at age 45, I decided to really start working out and hired a trainer and lost a lot of weight and gained a lot of muscle, apparently too much muscle (for figure anyways), and I like how the diet and workouts made me feel, and having a goal to shoot for gave me a certain feeling of power and control. I became very focused and when I started winning it was even more of an incentive. HRA: What is your training like? Do you follow any of the popular philosophies as to numbers of sets and reps? AM: I train every day of the week either just cardio or weights and cardio - when I get closer to my show I do two workouts a day. I pretty much do my own thing - always changing up between machines, free weights, cables. The reps and sets usually stay the same, depending on my time, energy, or increases in weight. I usually superset everything e.g. - Chest Flies 10 reps, chest press 10 reps, then I do 15 push ups - no rest. Then I’ll go do a Tricep routine. I do this sequence 3-4 times, then move on to my next chest exercise. My workouts usually run 2 hours - includes 30-40 minutes of cardio. The evening workout usually consists of either more cardio machines or a Billy Blanks CD for 1 hour. HRA: What has been the reaction of your family and colleagues to the changes in your physique? AM: My family has been very supportive and encourage me in all my efforts. My co-workers, at the Fire Dept., are supportive as well and admire the dedication that it takes - especially when they cook up such good meals everyday - including deserts. HRA: As a female bodybuilder, do you find that comments from those outside of bodybuilding circles are largely positive, or not-so-positive? AM: I personally have had only encouragement from my friends. 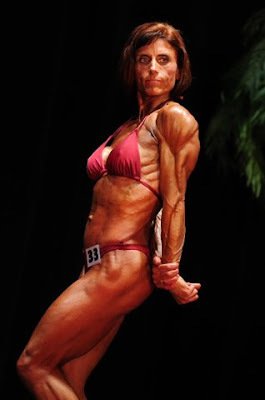 I feel that my physique - even at contest times - is not overdone. I get a lot of people asking me what I eat, how long have you been working out or “I need to start working out with you” comments. HRA: Do you allow yourself to gain much weight between contests (i.e., off-season), or do you stay somewhat close to contest weight all the time? AM: I try not to gain to much weight between contests, 10-12 lbs. I’m learning with each show and off season that each of them are equally important. HRA: Do you prefer to train alone or with a partner? AM: I have trained alone for a long time - although it gets tough at times focusing. I do have a partner for the most part now, when we can coordinate our work schedules. She knows that I’m focused when I’m at the gym and I’m there to workout only. It sure makes cardio a little easier to have someone to talk to or know that they are working hard as well. HRA: Do you have a hard time trying to squeeze in training between work and life's other demands? AM: Sometimes my life seems to conflict more than work with my workouts. But, I plan close to everything around my workouts. If I have to go early to get it in I’m there 4:30/5:00 am. HRA: I know that you are a natural bodybuilder. But because you have a great physique, John Q. Public is not necessarily going to believe that. Have you had people accuse you of taking anabolics and, if so, what is your response? AM: I am a natural bodybuilder and anyone that knows me, or I care to know, knows that I do not use anabolics and that’s all I care about. However, I would just tell them that it isn’t necessary if you know how to perfect your diet and workouts and be consistent. I also feel that someone who uses is fairly easy to spot. I’m pretty feminine/curvy - not bulky, square jaw, or deep voice. I think my body fits me all around and someone who uses, usually does not. HRA: If you had to give one piece of advice to someone just starting out, what would it be? AM: Make sure you are committed to see it through; no one truly knows what it takes until you actually decide to give it a go. I also think it scares a lot of people and they never try. Keeping track of your diet, planning everyday for the next day - up to the next week never leaving anything to chance - too easy to cheat. Never miss a workout, even if you cut your reps or weights, STILL GO! Because you will make it through and you will be proud of yourself. Just keep telling yourself, as I have many times, “You can’t finish if you don’t get started”. HRA: Do you have any other notable interests or hobbies outside of bodybuilding? AM: My family is my hobby/interest. Most of my kids are older (3 daughters - 21,22,25). But I supported them at every one of their basketball games, track meets, softball games, band concerts, etc. My son (7) keeps me busy with football, basketball, softball, karate, boy scouts, destination imagination - oh yeah - all the other playtimes he comes up with. He is a lot of fun. But I also love to rent movies, eat, go on walks, read, dance, sew. HRA: What are your plans for the future? Do you have a "next contest" picked out? AM: My next show that I’m working towards is in Buffalo New York: "2009 WNBF Pro Natural Ms. Supernatural Women’s Master Cup Bodybuilding & Figure Championship” on October 3rd (Wow, what a mouthful). I’m already starting to train and diet for it. My last show was in VanCouver, Canada: the “Police and Fire World Games”. There were 8 women competing for the gold. Luckily I brought home both golds - one in my weight class and one for overall.